It's not time to bail yet. Lululemon Athletica (NASDAQ:LULU) stock is down 20% after reporting earnings last week, in which management's comments about slower traffic spooked investors. Management expects comparable-store sales growth to slow to low single-digits in fiscal 2017 from 6% in fiscal 2016. Despite lower traffic trends to start the year, Lululemon is pushing ahead with its growth strategy in areas that have been showing lots of promise, such as China and the men's category. Overall, for fiscal 2017, management guided for higher revenue of $2.55 billion to $2.6 billion and higher earnings per share of $2.26 to $2.36. Lululemon is still growing, but not as much as investors expected, which is a large reason why the stock declined so sharply following the earnings report. Going into the earnings announcement, Lululemon stock was trading for about 30 times earnings; now it sells for about 22 based on management's guidance of $2.26 in earnings per share for fiscal 2017. LULU PE Ratio (Forward) data by YCharts. We have clearly identified the issues, an assortment lacking depth and color for spring compounded with visual merchandising that did not powerfully translate our design vision. With focused urgency our teams have been cross correcting the issues, with early indications reflecting an immediate and positive impact on performance. We will see more color in selected style as early as next week. In 2013, then-new CEO Laurent Potdevin inherited a mess after quality issues arose with some of Lululemon's yoga pants made with its popular Luon fabric. Potdevin set out to turn the company around while expanding the men's category and growing the business internationally. Despite a weak retail environment, Lululemon's management has achieved that goal. Gross margin for the fiscal fourth quarter was 54.2% due to higher average selling prices and better alignment of inventory with demand. For the full year, Lululemon achieved a gross margin of 51.2% in contrast to less than 49% in fiscal 2015. When compared to Nike's gross margin contraction to 44% in its most recent quarter, Lululemon performed very well. Management has implemented a few things to improve gross margin. One is a focus on creating greater demand through innovation like the recent Nulu fabric, which has been a hit. The company is further developing this fabric with Nulux. As Potdevin commented on the earnings call, "We've got an unprecedented amount of product innovation and global brand activation that's ahead of us for '17 that will definitely drive traffic and conversion." Lululemon is also improving gross margin by shipping more product directly to customers from stores. This helps the company clear slower-selling styles at higher margins. Lululemon has over 80 stores participating in this program, and plans to increase this number to 145 by the end of the second quarter. The growth in the men's category is also contributing to margin improvement. The men's business grew 20% in stores open more than a year. Lululemon's Mall of America store doubled its men's square footage and saw a 70% increase in the men's category without increasing inventory. Management is targeting $1 billion in revenue for men's clothing, or 25% of total revenue by 2020. Men's has been an underserved category of Lululemon in the past, and this management team seems to be focusing on it more as a driver of future growth. Can Lululemon reach $4 billion in revenue by 2020? This is the big question. Last year, management set a goal of reaching $4 billion in revenue by 2020. Fiscal 2016 revenue increased 14% to $2.3 billion, so Lululemon needs to grow annual revenue 15% per year to achieve its 2020 goal. Management is implementing a few initiatives to accomplish its growth plans. First, the company is planning to launch a global brand campaign in the second quarter with a "dynamic creative agency that is also the leading amplifier and distributor of content to millennials across the world," Potdevin explained on the conference call. Second, Lululemon will be launching the new Fast & Free collection featuring the Nulux fabric. Given the popularity of Nulu and Nulux fabric, management expects this new collection will drive revenue for 2017 and beyond. Finally, China is a $28 billion market and growing, which is a big opportunity for Lululemon. The company's fastest growth right now is in the Asia region. China has 415 million millennials, a growing middle class, and an interest in fitness driven by government investment in sports. Morgan Stanley has estimated the global activewear market to grow from about $300 billion in 2016 to over $350 billion by 2020. Athletic apparel is the only good thing happening to the apparel industry right now, apparently. In fact, apparel sales would have declined in 2015, according to NPD Group, if not for growth in athletic apparel. Potdevin has improved Lululemon's position from a few years ago. The company's cost structure is in order, as seen by the strengthening gross margin, and management seems very focused on pursuing the growth opportunities in men's, new fabric innovation, and expansion in China where there is growing demand for sports wear. Store traffic will come and go with the economy. If you owned Lululemon shares going in to the earnings announcement, I don't see a reason to bail given the company's improving margins and its growth plans. 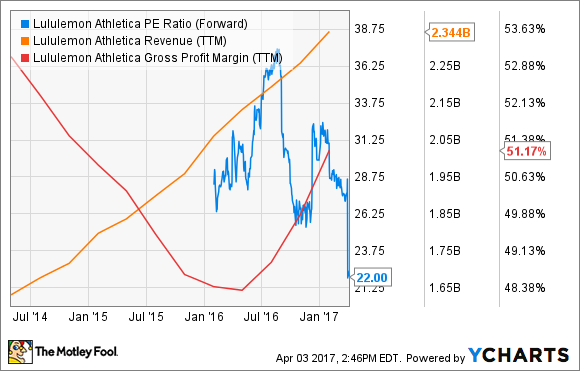 If anything, the stock is more attractive with a lower price-to-earnings ratio, making it a potentially a better buy for investors interested in the growth of athletic wear.